Claey's old fashioned watermelon candy drops. Now you can enjoy that old fashioned watermelon flavor in a delicious hard candy drop. Watermelon drops are have sweet and juicy watermelon flavor, each drop is sanded which means they are coated in a fine sugar. 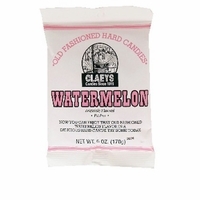 Each Claey's watermelon drops have a long lasting flavor. Claey's old fashioned sanded drops come in a variety of flavors to choose from. Lemon Drops, Cinnamon Drops, Wild Cherry Drops and Horehound are just a few old time favorites.